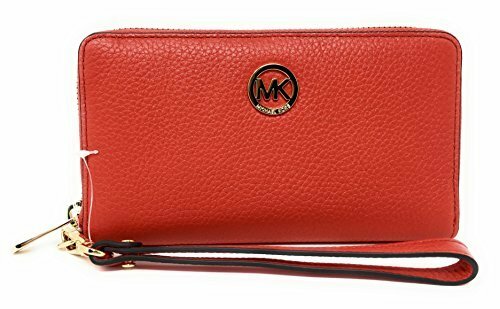 Michael Kors Fulton Large Flat Multifunction Leather Phone Case (Dark Sangria) | What Should I Say? Wrapped in soft pebbled leather with polished tone hardware. This zip around style large flat multifunction phone case is accented with Michael Kors circular logo on the front. The leather and fabric interior features 5 card slots, a clear ID slot, and a slip compartment. It also offers a small zippered pocket and a back wall compartment that will fit most smaller models of iPhones, Samsung Galaxy and Blackberry phones. It features a removable leather wristlet strap which enables you to carry it as a clutch as well. It measures approximately 6.5 inches (L) x 3.75 inches (H) x 1 inch (W).